CR-V = Value: a simple equation that will mean a lot to parents. The 2013 model won a "Best Cars For Families" award from U.S. News & World Report, and was named on a "10 Best Family Cars" list compiled by Edmunds.com and Parents Magazine. Going into the new model year, it continues to offer the same terrific combination of comfort, dependability, passenger-focused features and fuel efficiency. This not only makes it a top pick for families, but also an excellent option for anyone who requires the added space of an SUV. If you're in the market for a utility vehicle, choose one that has been vetted by critics. 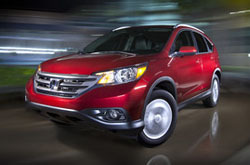 Along with the abovementioned awards, in a recent 2014 Honda CR-V review, Edmunds.com once again confirmed that it's their "top choice" among compact crossovers. Valley residents can find the new 2014 Honda CR-V for sale in Phoenix, AZ with three well-stocked trim levels to choose from: LX, EX and EX-L. No matter the selected model, the SUV offers a well-rounded mix of premium and basic must-have features, all of which are included to make your life on the road easier, safer and more enjoyable. Standard amenities include: full power accessories, air conditioning, a tilt/telescope steering wheel, one-pull fold-flat seats, a rearview camera, Bluetooth HandsFreeLink, Pandora internet radio, a USB/iPod interface and more. The standard engine is a 2.4-liter four-cylinder that produces 185 horsepower and 163 lb.-ft. of torque. With a five-speed automatic transmission and front-wheel drive, the CR-V delivers 31 mpg highway. All-wheel drive models also offer impressive fuel economy with a 30 mpg highway rating that is actually achievable in "real-world driving, unlike those of several competitors," according to Edmunds.com. If you're shopping for a compact SUV in Maricopa County, visit us to browse inventory and test drive the award-winning Honda CR-V in Phoenix today. Stop by anytime during store business hours or schedule an appointment in advance by calling or filling out the contact form on the right. Bell's 2014 Honda CR-V review continues below. 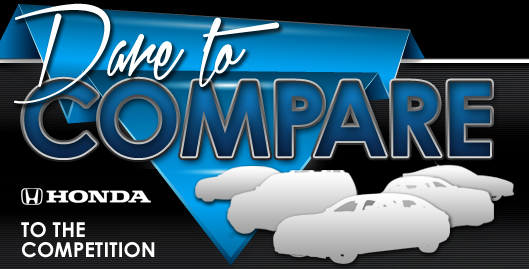 When you compare Honda's most current CR-V model against the 2014 Chevrolet Equinox, Toyota RAV4 and the Kia Sorento, you'll find out that it beats out the competition. 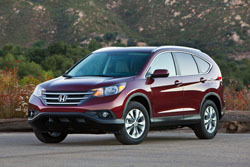 Just a few of the attributes that shoppers in Arizona will enjoy are the CR-V's exquisite looks and affordable MSRP. You'll undoubtedly see it's a truly outstanding value when you compare its price to competing vehicles. 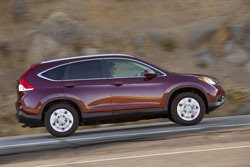 For more details about what it offers, check out the CR-V's quick-facts list under this text. Make the search for your next car less of a hassle with Bell Honda's reviews, like the 2014 CR-V overview above, as well as other Honda reviews in our gallery. There is a reason why we are one of the Phoenix area's reputable Honda franchises. Just one reason is that we provide reviews created by well-informed automotive writers. Each summary is bundled with essential information, including info about cabin amenities and more - everything you need to make an good purchasing decision. Now that you've viewed Bell Honda's CR-V review, please contact us to arrange a test drive or learn about limited-time dealership offers and incentives.